Both juveniles and adults may be referred to the Restorative Justice Program for misdemeanor and felony cases. 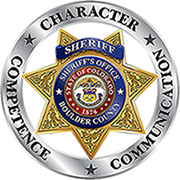 Boulder County Sheriff’s Office Deputies assess whether or not a restorative justice process is appropriate for those involved and make referrals to the program instead of issuing a summons. The Community Group Conference is a pre-court diversion. The Community Group Conference process brings together the parties most impacted by a crime- victim, offender, community and law enforcement. The process is victim focused, meaning that the needs and concerns of the victim are given highest priority in the process. Restorative justice conferences seek to repair the harm done to victims and the community while reintegrating offenders back into the community. The process provides the opportunity for victims to be heard and their needs addressed, offenders to move toward accountability and responsibility, and the community to be involved in the process. Step 3 – Together, participants create a plan (contract) for how to repair the harm. The restorative justice office monitors this plan and encourages the offender to successfully fulfill his/her obligations created in the agreement.